A vegan activist in France who posted a Facebook message said to be insulting to a butcher killed by an Islamist militant during an attack last week is due to appear in court, reports say. She is alleged to have said she had “zero compassion” for the victim. She is to appear before a judge for condoning terrorism. 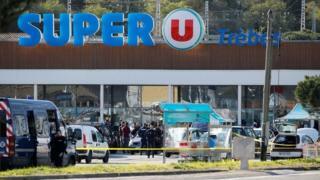 In last week’s attack, Radouane Lakdim killed four people, three of them in a supermarket in Trebes, including butcher Christian Medvès. The activist was detained by police in Saint-Gaudens, not far from Toulouse, in the south-west of the country. “So does it shock you that a murderer gets killed by a terrorist? Not me, I have zero compassion for him, there is still justice,” she is said to have posted, according to a judicial source quoted by the AFP news agency. Condoning terrorism carries a maximum seven-year jail sentence and a fine of up to €100,000 (£88,000). Her appearance in court comes two days after a left-wing activist received a one-year suspended sentence for hailing the death of another victim of the same attack, gendarme Arnaud Beltrame. France’s butchers federation said it had filed a legal complaint against the author of the post, which has been removed. Lt-Col Beltrame, 44, died after being shot when Radouane Lakdim – who claimed to be a supporter of the Islamic State group – stormed the Trèbes supermarket on Friday. He has been hailed as a national hero after trading places with one of the hostages. Sixteen people were injured, two seriously, in what was the worst jihadist attack under Mr Macron’s presidency. The gunman was shot dead by police.